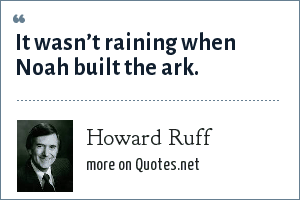 Howard Ruff: It wasn’t raining when Noah built the ark. "Howard Ruff Quotes." Quotes.net. STANDS4 LLC, 2019. Web. 24 Apr. 2019. <https://www.quotes.net/quote/73957>.